I have on occasion toyed with the idea of putting together a compilation of RD Burman instrumentals. It would, inevitably, be a fantastic collection, and 'Dance Music' from 'Mukti' [review] would be one of its finest tracks. I've played it non-stop since obtaining the soundtrack a few months ago. If Ennio Morricone, Henry Mancini and Lalo Schifrin had ever worked together, the result might have sounded like this: A multi-faceted masterpiece, with a jazzy Euro-bossa vibe, wordless vocals à la Edda Dell'Orso (c/o Usha Iyer? ), swirling strings that remind me of Scott Walker's great 'Plastic Palace People', cool lounge-funk, breakbeats (toward the end); all serving to enhance a perfectly sublime, haunting melody. Initially, the rest of the album didn't interest me much, but it's grown on me immensely on subsequent listens. 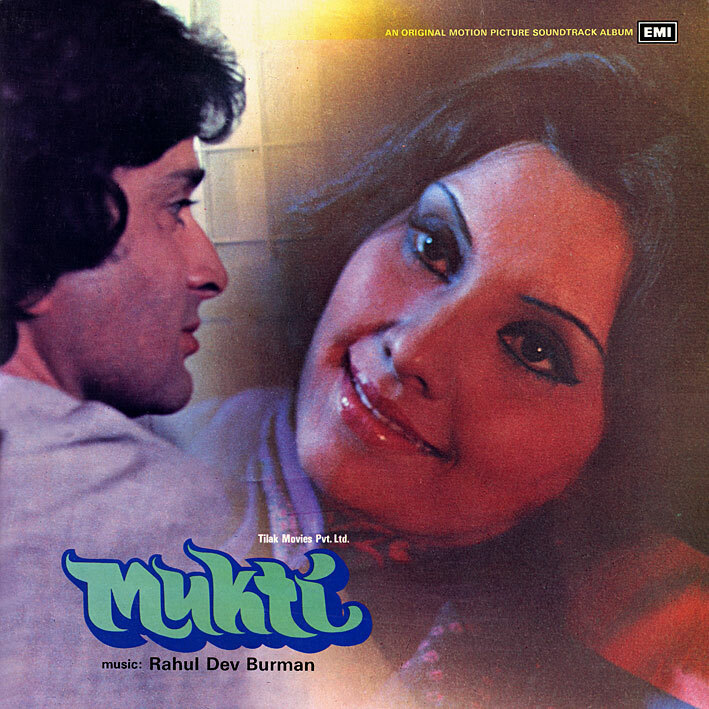 Low-key throughout - there's Rafi's wonderfully soulful 'Pyar Hai Ik Nishan Qadmon Ka', Asha's sweet and poppy 'Dil Sajan Jalta Hai' (with a neat ska-tinged break in the middle), the melancholy sounding 'Lalla Lalla Lori Doodh Ki Katori' and 'Suhani Chandni Raten', and finally the fun and playful 'Main Jo Chale Pee Kar'. And did I mention the instrumental? Looks interesting, thanks for the tip. Always been a favourite that Dance track . I'm 99% pretty sure that's the voice of Anette Pinto. You'll hear her on loads of RD stuff like the Heera Panna theme, and most bizarrely - here http://www.youtube.com/watch?v=AMu65O98GFk - gargling Babu's theme for Rd Burman... . Thanks for the post. I never got round to ripping this from my vinyl. K.
Anette Pinto sounds about right, yes. Shamefully, I keep forgetting about her. Am I right in thinking she did The Burning Train theme as well? Thanks Kas! I'm guessing so. Easy to forget as she's so rarely credited! #6 is lullaby my mom used to sing to me and my brother when we were young. Brought back good memories of a time gone by... Thanks! Thanks PC. This is a great album from Panchamda. Lalla Lalla is an excellent lullaby. My fav in this album is Pyar Hain Ek Nishan beautifully rendered by Mohd.Rafi. This has a bengali version too " Madhumaas Jaye" sung by Panchamda himself. And yes Dance Music- this too has a great impact on myself. Gakk. I thought "The Burning Train" was Burman and Usha Iyer. You should definitely do a compilation of RD Burman instrumentals. It's a fantastic idea. Cheers to that!